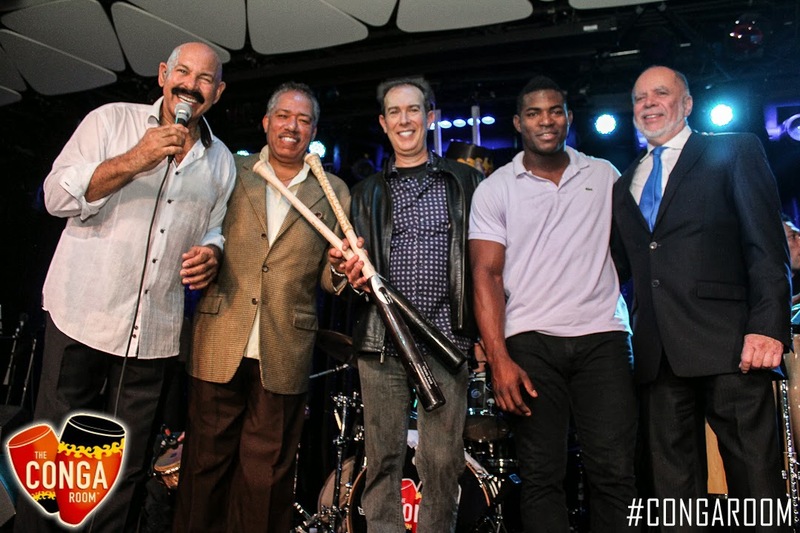 The Conga Room at LA Live in Downtown has been hosting a weekly Thursday-night Latin music series called “Latin Kings of Salsa,” and Yasiel Puig was on-hand recently to welcome Venezuelan salsa legend Oscar D’Leon. No doubt he spent the evening feeling sad about the recent Dodger exit from the playoffs by hitting the dance floor to the sweet sounds of 'Llorarás'. As you can see in the photo above (Photo Credit: Juju Andrade), he gave D’Leon a signed playoff bat. BTW, Oscar D’Leon is the fellow with the huge mustache on the far left. I'm not sure who the other guys are in the photo above (expect for Puig, of course), but I think the person in the middle is the Conga Room owner - Brad Gluckstein. You can find out more about the Conga Room venue here. BTW, if you haven't seen this already here is a childhood photo of Yasiel Puig. This was tweeted out by Puig and MLBPA as a part of 'Throwback Thursday' promotion. "Late-night thought: Yasiel Puig might be somebody Billy Beane would secretly target for a surprise deal." "Are the Dodgers shopping Puig? You bet and the Cubs are one of several teams interested." Soon, it became an honest-to-god rumor complete with folks believing that all of this was based on secret sources and valid insider discussions. Being the cynic that I am, I find all of this rabble to be a big load of dung - like, a big emerald encrusted beetle covered with last nights chilli. At this point, I'll believe it when I see it. On the other hand, I do believe everyone (with exception of a few players - Kershaw, Greinke, Ryu, Jansen) could be traded if the right deal comes along; including Puig. But, it would have to be similar to the kind of booty received during this past season tradeline trades - which means a lot of top prospects and solid players. After all, Puig has a proven two year track record in the league and guys like Soler and Bryant of the Cubs haven't proven anything. Oh, and if you want to read some click bait check out Tim Kawakami's follow-up article at the Mercury News explaining his initial tweet about trading for Puig, here. It's a big load of crap. You think Billy Beane wouldn’t see if he could get Puig for Jeff Samardzija? I’m pretty sure he would. Samaradzija’s only signed through next season, so he’s probably not the guy who gets you Puig, but I’m just offering that as a name to start. Hey, knowing Beane, it wouldn’t shock me if he allowed that Sonny Gray, at some point, could be had for a mega-package. All A’s stars will get traded or will leave at some point, everybody has to understand this. Besides, if the Dodgers are really looking to replace their GM, how in the world can they even contemplate a trade now? You would think that the GM issue would get handled first before any big trade happens.